My upcycling project began with a trip to the ReSource scrapyard and a faint idea for a sculpture design. I quickly realized that my idea would have to change due to the available material constraints. The brainstorming cycle became: “what could I possibly create with this material?”. Many items would inspire an idea and ensue a scavenger hunt for other parts to fit that design. One such idea included a “junkyard” car, inspired by a piece of duct work that reminded me of the blowers you see on racing cars. I found some neat parts to add to the design but eventually aborted the idea due to lack of supporting materials. I also explored parts that followed a surrealistic aesthetic which I covered in my first blog post. Eventually, I returned to the same piece of duct work that reminded me of a blower. However this time, I connected it with looking somewhat like a gramophone horn (old-timey record player). As a collector of vinyls, I thought a gramophone sculpture design would be great. A moment later, I saw some steel pipes which sparked the idea to cut them at different lengths to create a church organ aesthetic instead of a gramophone horn. I combined the ideas to design a record player with organ pipes set behind the spin platter. After browsing further, I found a piece of granite and “bamboo” shelving to make the base from. In total, I purchased four five-foot steel pipes, a piece of granite, and the wood shelving for around $7. My aesthetic intent was not clear at this point, but I believed that the combination of granite, “bamboo”, steel, and a record player would make for a thought-provoking piece. The length of the granite allowed for twenty-one pipes to be lined along the back. I decided to make the center pipe 12″ while the pipes to the right of the central pipe would descend in 1″ increments from 11.5″ to 2.5″ and the pipes to the left would descend in 1″ increments from 11″ to 2″. This staggered effect follows the pattern used in pipe organs to produce different notes. I cut the pipes using a bandsaw, then used a grinder to smooth the pipe ends. In order to really convey the pipe organ aesthetic, though, I decided to mill a “mouth” into each pipe using a 7/32″ bit. 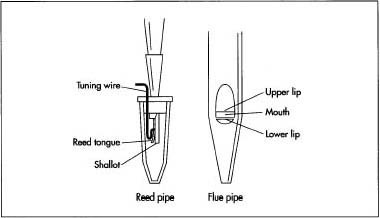 Actual pipe organs have a concave portion above and below the “mouth”, but the machining for this feature would have been very difficult. Also, organ pipes taper towards its base. Due to the form of the steel pipes I purchased, this was not possible either. Since the bamboo shelving was much to long for the intended design, I had to cut the piece to fit the length of granite using a table saw. I made another cut to take the finished edge from the extra material and attached it to the cut piece using wood glue. The granite slab was stacked on top of the bamboo wood shelving and attached with adhesive. In order to create the turntable, I used a laser cutter to fashion a 7″ diameter neon green piece of acrylic. For the tone-arm, I used an old wrench and attached a paperclip segment to the end to imitate the needle. Lastly, I borrowed two knobs from an old receiver. This design loop seems to follow the nature of the process for upcycling to make art. If the design was meant to be functional or dynamic, the design loop would of looked much different. I’m a big fan of the contrast between the green acrylic and the rest of the piece, nice job! Wow, this thing looks really interesting. It’s what I imagine late 19th century futurism to look like. Now, you could use a bunch of band pass filters to separate frequencies in music out. The signals corresponding to each frequency could be used to control blower fans and actually make this this plan crude arrangements of whatever music you ran into it. The glowing acrylic is really cool! It makes the record player look a little ominous. I really like how the green reflects off of the organ pipes. The granite also serves as a great base, really like the dark color you chose. The glow of the acrylic looks super cool! Its kind of a combination of modern and old, like steam-punk. Nice work! I really like the way the acrylic catches the light on the turntable. The materials all look very clean and well put together. The cuts on the pipes are clean and well done. I really like the textured effect the base of the record player has. Very cool project. Super cool contrast between old school pipe organs and less old school record players, while maintaining a common music thing. That is super cool how the acrylic glows under light. The attention to detail with the staggered pipes is great. The arm should have a counter weight, since that’s what record players have. Also, it might be cool if there was a second layer of pipes, like in the photo above. Good work! Awesome looking final project! I like the detail that you put into the design and how it seems to bring together a variety of different aesthetics. Good use of material! Your design is really cool. I like the use of the green light. It really makes the piece POP. The organ style pipes really add to the overall music/steam-punk aesthetic. Does it work? Would you want to try to make it work? What was the hardest part? The design of this is extremely interesting to me. During the design process, did you ever consider making the pipes a functional component of the piece? Maybe the pipes would project sound much like a gramophone’s horn would? I know that the piece isn’t functional like a typical record player, but I think it would be extremely interesting to have a record player that looks as unique as this one does. Very nicely done. Neat sculpture. I like how the acrylic glows, but I think the green color is very distracting. Maybe you could use a slightly less florescent color. The aesthetic of pipe organs is really cool, I like how you used pipes on the back to add more depth to the piece. Like others have said the neon lighting aspect is really cool and its always fun to see good things that happen on accident. Does a 45 fit on the platter? I also think a few more buttons or dials may help it look more like a record player. This is a really good looking project, I like the some what mixed aesthetic of older looking organ pipes and the new looking acrylic. I really enjoy the aesthetic. The appeal of the traditional organ with music technology works really well together. In the future, it might be cool if you made it so that it was able to play or create music. Interesting use of materials that you don’t often see together. I also liked the contrast between the acrylic and the granite. Maybe you could add some lighting to the pipe organ to take the project forward..
Hey the final outcome of the project look great! The neon glowing record player gives that fun psychedelic look you were kinda going for, plus did not know it was all natural lighting. The combination of the record player and organ play right into each other. The art piece speaks to me! If you wanted the record player organ to have greater structural integrity, then I would recommend building a wooden stand that fastens to the base board. Instead of integrating an actual record player, you could easily embed a blue tooth speaker below to allow it to play music. It would allow it to be functional art, without turning it into a massive undertaking. I imagine it would be incredibly difficult to manufacture actual organ pipes. Nice presentation! I really like the acrylic! that would be a really cool look for a working version too. The pipe cutouts are really symmetric- solid job! Beautiful! Love the contrast of technology, steampunk like. I really like how this turned out. It definitely does capture the attention and it is visually attractive. I think that this is like a clash between a Gothic (like a traditional Gothic church, not modern goth), the era of music record, and the space age of music. That disc is really cool, it definitley adds a focal area to the piece. It would be awesome to have something very similar that functions. Cool design, looks like a classic vs modern mash up, great use of the acrylic to add a bit of liveliness, would be great to see if you could make it functional, people pay big for custom music players/ speaker systems. Neat idea. I would be awesome if you could play music. The glowing plate is amazing. The acrylic catches the light in an incredible way. I honestly thought that it was lit from below. It would be amazing if it played music, but I don’t know how to make it happen. Great aesthetics. Symmetry is very clean. I like that it glows when the lights hits it THAT WAS AWESOME. Nice ideas for improvements. Can you add actual Gothic music to the design (with a small speaker). Nicely finished. Great Job! Nice project, the integration organ pipes and record player is interesting. I wish if I could tell what it is by looking at it as I feel that the organ pipes are dominant and record player not so much. Might be the angle I was looking at it though. Very cool idea and use of the materials. The concept and combination of materials is unique. I really like the way the light bounces off and it somewhat glows. I really like the overall music aesthetic you created here with the organ and the record player. The cool way the acrylic of the record disc traps light is a bonus! I really love how you combined two musical processes into the one! The acrylic is really amazing and adds a futuristic look mixed with a retro look! Very beautiful and creative design! It would be so amazing if you could figure out a way to make it function as a musical instrument/player! The glowing green of the acrylic really adds a unique element to the whole piece. Looks very nice! Great piece of art! I would love to see this become a real record player. If you’ve ever been to The Church Nightclub in Denver, this would totally fit their style of art. “Gothic rave” is a perfect description! I like the clean, modern look you achieved and it is amazing how the acrylic seems to glow a green color. The granite surface also makes it look professional and clean. I thought that you had put an LED beneath the “turntable” somehow, which is really cool! While it doesn’t actually play a record, at least it looks really cool! This thing looks pretty professional. It would be neat to actually have music come from it – maybe just speakers in the body connected to a music player. I really like the way your project looks with the neon green acrylic. It definitely has a cool aesthetic of its own, but it would be cool if it worked and if the organ pipes did something other than were just for the aesthetic appeal. Cool design, really interesting how that disk lights like that. I like the the staggered pipe organ. I love the light, very homogeneous spread, has a cool glow, I’m very interested about the cause of this. I love the modern light contrast on the pipe organ and natural of rock and wood. It looks really cool. Kind of it’s own aesthetic, like nothing I have ever seen before. The way it captures the light is wicked. Awesome design and idea. Who make a great room decoration for any person who loves music! I really like the approach that you took for this project. Finding cool materials and letting them provide the inspiration can make for some really unique and original art. It is easy to get stuck trying to find the exact part that you have in mind, which can end up being really limiting. I am not sure if I would have thought to use a piece of granite as thinking about having to cut it would have initially scared me. It turned out to be perfect, and it give it a premium feeling. Also, adding the lip to the pipes makes this thing look like it would actually play music. Since it so closely resembles a mini organ, the neon green disc makes you think that it could be a modern tech toy. If you didn’t look too closely, you could easily mistake it for an exotic piece of audio equipment. I could actually see this thing being set up as a statement piece in a dimly-lit bar. Your design loop is spot on for an upcycling project. Neat form you came up with. Because it’s a rather literal interpretation of a musical console, I totally image this thing belting out notes! Good work bringing together materials into a concise form. I enjoyed the description of how your brainstorming process turned into a scavenger hunt based on what you had found so far. I’ve never heard it said like this before, but it happens all the time. We start projects and then find ourselves running to the hardware store to finish them. In the end of the day, the the material available calls the shots. You mentioned that collecting vinyl provided some inspiration. Did you ever consider using vinyl records in your design? Google-Images have some great pictures of vinyl records turned into art. You mentioned that there wasn’t a distinct aesthetic in mind. It would have been interesting to see how your design may have turned out if you pulled an aesthetic out of a hat. With the classic materials and organ pipes juxtaposed to the glowing turn table, I suggest “Gothic Rave” or something. In addition to the unique piece you have created, the materials you’ve chosen to work with have great potential for other interesting forms especially when setting out to make art for art’s sake. For example the pipes could be cut at an angle and fanned out to create a sense of movement. Or perhaps the neon acrylic could be heated and formed – to resemble something like the Experience Music Project in Seattle, a building designed by architect Frank Gehry to resemble Jimmy Hendrix’s melting guitar during an LSD trip.